ConvertFlow, a Miami-based tech startup specializing in onsite marketing automation software, was named Champion of the Battle Of The Apps at ICON, Infusionsoft's 10th Anniversary user conference held in Phoenix, Arizona. 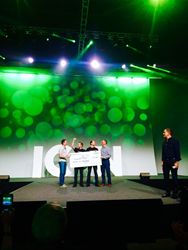 It's an honor to have been selected for this prestigious award by Infusionsoft's founders, team and community. At ICON, Infusionsoft’s 10th Anniversary user conference this past week, ConvertFlow, a Miami-based tech startup, was selected as Champion of the Battle of The Apps competition for 2016. Battle of The Apps is an annual contest designed to select the best of the best software and web apps from Infusionsoft’s partner network and marketplace. ConvertFlow, winner of this year’s competition, is an integrated onsite marketing automation platform that shows targeted calls-to-action to leads, prospects and customers interacting with a company's website. It fully syncs with leading CRMs and other marketing tools to automatically deliver relevant, timely and personalized marketing messages.